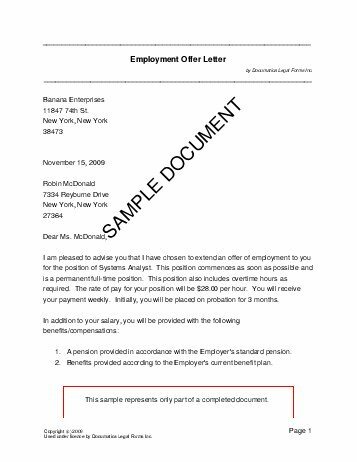 An Employment Offer Letter is sent to a prospective employee to outline the exact terms and conditions of his or her new job. It may include information on start date, working hours, salary, bonuses, vacation, probation period, and numerous other details. Do you wish to use the Employer's name in the letter (instead of saying "I")? Does the job occasionally require overtime? Is there an initial probation period for the position? What is the frequency of payment? Do you require any other information or documents before the employee starts work? We strongly recommend obtaining an attorney reviewed Employment Offer Letter directly from us. Below are some random samples we have created with Documatica. Please note that these documents reflect a certain set of answers, and it is very likely that the document you require is different. 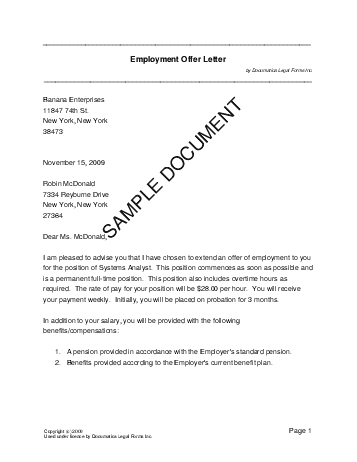 Do not rely on the templates below - create your own customized Employment Offer Letter with our webpage. For maximum legal protection, obtain a lawyer reviewed Employment Offer Letter directly from us.